You bring me closer to pod. According to the Metro UK, the new Ecocapsule is a small sanctuary that can safely stash you anywhere in the world. The 2.5 x 4.5 meter pod is a one-man outpost that allows you to exist in remote locations without sacrificing modern comforts. It's like every fort you built as a kid, except more awesome, and with power. Even if it's dark outside and lacking windpower, an integrated battery will still keep the juices flowing. Speaking of juices, rainwater is collected, funneled, and filtered by the Ecocapsule, adding even more sustainable sweetness to your digs. So if you're going to run away, do it in sustainable style! 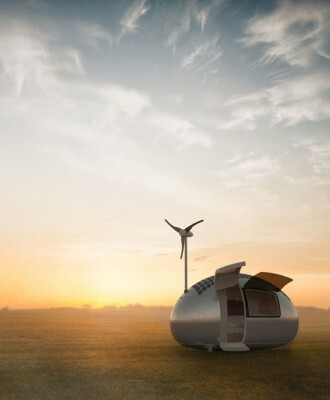 The Ecocapsule begins shipping late this year, and will have even more options available in 2016. Habitation has never been so helpful. Not sure if it's meant to be lived in or hugged. Maybe both. This is a new idea for living but any body who wants to live in there wants to see more details before moving into this new house. Awesome and interesting article. Great things you've always shared with us. Thanks. Just continue composing this kind of post. Denny Whitney Your website is really cool and this is a great inspiring article.